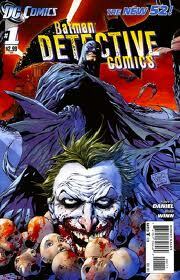 It’s probably fitting that Week 1 of DC’s New 52 reboot contains the venerable Detective Comics. The original comic introduced Batman to the world, and ever since it’s been a mainstay of DC’s offerings, and one of their most important and best-selling titles. Long, long ago, Detective was an anthology book with different stories about lots of different characters. This version stays true to the modern incarnation of the book in that it contains exactly one 22-page Batman story. There are some minor changes to the world of Batman. He’s only really been around in Gotham for 6 years, and the police force is still getting a feel for him. This is Batman very much in his Urban Legend guise, which comes off a bit strange when contrasted to his “I’ll fly the plane” Superfriends type role in this week’s Justice League International (which I’ll get to in a later post). But whatever, Batman has acted differently in the upteen books he’s been in every month for years, so there’s no reason to expect that to change. Stuff that has changed: Jim Gordon is much younger, and has red hair again (we see more of him in this week’s Batgirl). There are new holograms hiding the Batcave, and indeed Batman’s assistant Alfred makes his only appearance as a hologram. Is Alfred actually a hologram now? Too soon to tell. That’s basically it for the differences. Gotham is still Gotham. There’s no Robin to be seen, but we do get an oblique reference to Catwoman. The villain, probably appropriately, is the Joker. The issue opens with the Clown Prince of Crime fighting a battle to the death in his apartment against a crazy killer who wears a half-mask of human flesh. At least I think that’s what’s happening. Daniel’s script and execution (easy to point the finger of blame when the same guy is doing both) of the opening scene are so muddled that I still don’t understand what the hell was happening. This guy later is revealed to be the son and assistant of the Dollmaker, a new surgical-themed villain. I think we’re supposed to assume that the motel room in which the comic opens is a safehouse of the Joker’s, but Batman later discovers the 11-year-old daughter of the surgical assistant in the wreckage of the room. What, so this killer took his little girl to a plastic surgery housecall at the Joker’s house? Doesn’t seem like the smartest idea to me. In fact, it’s downright confusing, and even the reveals in the book’s final pages don’t do much to unravel the mystery of who lived where in that opening scene. It’s a little thing, but the very beginning is not a great place to muddle your storytelling, so the confusion leaves a bitter taste throughout the rest of the issue. Drawing-wise, Daniel is more than competent. His take on the Dark Knight seems heavily influenced by Frank Miller’s style of drawing Batman, and lots of his individual renders are really beautiful. I think he needs more work on scene blocking and scripting, though, especially if he’s going to be working mysteries into the plot. Aside from the sloppy storytelling, my biggest problem with this issue is that it doesn’t take advantage of the opportunity presented by the relaunch to do anything actually new with Batman or his world. This would have been a perfectly acceptable issue #237 of any random Batman comic, but as the lead off title of the relaunch of one of DC’s most important and venerable series, it seems like a wasted opportunity. There’s a doozy of a final splash page that’s sure to gross out a lot of people and that hints at a potentially interesting development for the Joker, but beyond that this is pretty standard, unambitious fare. That means that avid Batman fans will probably really enjoy it, but there’s nothing here to really hook new or casual readers. Clearly, the folks involved must have thought “if it ain’t broke, don’t fix it,” which is probably the safe play. But I can’t help feeling a little disappointed. This is the one that had me most intrigued – in no small part because the Joker is on the cover – so sad that it sounds like its on the weak side. I’ll need to hit you up for a spoiler on that last spread. Hell, I’ll bring in the whole issue and you can read it. I may be being overly critical. A lot of folks elsewhere seem to have really enjoyed this one.